Well, one of the best parts of the meal at the “down under” steakhouse is the bread that comes to the table along with the salad. That bread is so dark and moist and chewy and has just the faintest hint of sweet. Spread it with some whipped butter and my, oh my, I could make my whole meal from that bread and a salad. We went to our favorite chain steakhouse recently and afterwards I just couldn’t get the bread off my mind. I had to find a way to make something similar at home. So, naturally, I started searching recipes on the internet. After reading many, I narrowed the prospects down to two. One from Top Secret Recipes and one from Food.com. I took those two, combined the best parts of both and this Steakhouse Honey Wheat Bread is the result. It’s not precisely the same as the steakhouse bread, but it’s pretty darned close. As a matter of fact, BeeBop says it’s even better. I kinda agree. I so enjoyed making this bread. I forget from time to time how much I enjoy working with yeast doughs. There was a time that I made almost all our bread, but I got away from doing it for some reason. Too busy, I imagine. But after making this gorgeous Steakhouse Honey Wheat Bread last weekend, I’m all set to do more! The first step in making any yeast bread is to proof the yeast. That just means proving that the yeast is alive so it will be able to make the bread rise. 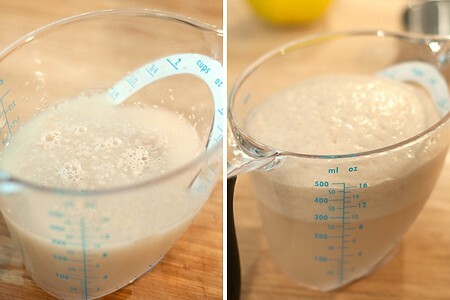 So, to proof the yeast, measure the warm water into a two-cup or larger bowl or measuring cup. The water should be between 105 and 110 degrees. The easiest way for me to measure that is with an instant read thermometer but if you don’t have one, no worries! Just use tap water that is no longer cool to the touch and feels nicely warm. Like a baby’s bath water :-) Add the sugar and yeast. Stir to dissolve. Within 5 minutes the yeast should have begun to bubble and grow. In the photos above, the yeast had been proofing for about 10 minutes. See how much it grew in that short time? That’s good, live yeast. Another tip – always check the yeast packet to make sure the date hasn’t expired. The yeast might still proof even if the date on the packet has passed, but it probably won’t be very lively. 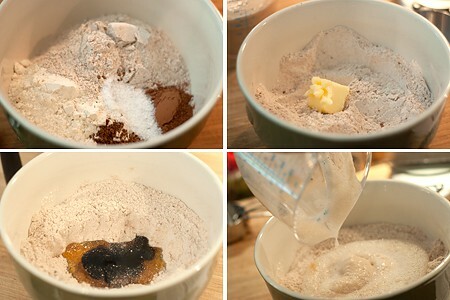 While the yeast proofs, mix the flours, cocoa, instant coffee granules, and salt in a large bowl. Stir it all together with a whisk. Using your fingers, mix the softened butter into the flour mixture. Make a well in the center of the dry mixture and add the honey, molasses, and yeast-water mixture. Stir from the middle, bringing the dry ingredients gradually into the wet. You can start out with a wooden spoon but you’ll need to use your hands to finally bring the dough together. Turn the rough, shaggy dough out onto a lightly floured surface. 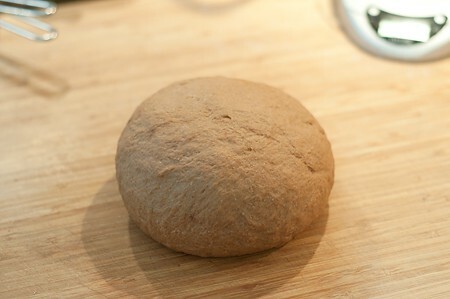 Just start kneading and it will quickly come together in a nice ball. Knead for 10 minutes adding small amounts of flour to the kneading surface only if the dough starts to stick. That’s the kneaded dough. See how nicely it came together? Doesn’t look anything like that shaggy mess it started out as, does it? 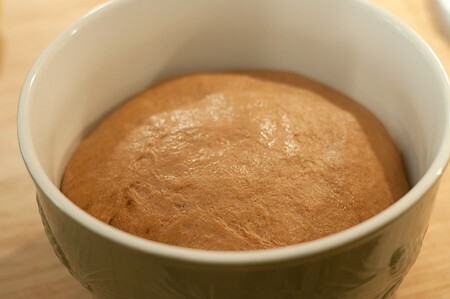 Let the dough rest for a few minutes while you wash and thoroughly dry the bowl that you used to mix it in. Spray the inside of the bowl with cooking spray. Put the dough into the bowl top side down and then turn it over so that the top gets coated with a bit of the cooking spray. Cover the bowl with plastic wrap and set it in a warm place to rise. The interior of your oven with the light on is usually just warm enough. Let the dough rise for 1 to 1 1/2 hours or until doubled in size. When the dough has doubled, turn it out and cut it into 6 portions. There’s no need to punch the dough down. Just let it deflate naturally as you remove it from the bowl. Form each portion into either a 6-inch loaf shape or a round mini-boule. Pour a small amount of cornmeal onto your work surface. Moisten each dough portion very lightly by wetting your hands, removing most of the water and rubbing your hands over the dough. 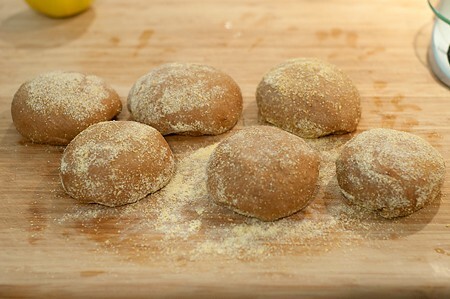 Roll the lightly moistened loaves in cornmeal to coat. Gently pat to remove any excess cornmeal. Place the loaves on a lightly oiled baking sheet. Cover with plastic wrap and set aside to rise for another hour or until doubled in size. Preheat the oven to 350 degrees. Uncover the dough and bake for 35-40 minutes. Remove from the oven and allow to cool for 10 to 15 minutes. A word of caution – because this bread has instant coffee granules in the dough, there is going to be a faint smell of burnt coffee while it bakes. I even became so concerned that I opened the oven and turned one loaf over to check while it was baking – something I almost never do. Don’t worry! The bread is not burning. It’s just that coffee interacting with the hot baking sheet. Note: if you want your bread to be a darker color like the bread served at the steakhouse, you can optionally add food coloring to achieve that result. You’d need to add 1 1/4 teaspoons of red, 1 teaspoon of yellow, and 1 teaspoon of blue. Stir it into the yeast and water before adding it to the water. I’m perfectly happy with the color of the bread without the added coloring. A copycat recipe for the famous dark bread served at Outback Steakhouse. Proof the yeast: measure the warm water into a two-cup or larger measure. Add the sugar and yeast. Stir to dissolve. Within 5 minutes the yeast should have begun to bubble and grow. While the yeast proofs, mix the flours, cocoa, coffee, and salt in a large bowl. Stir together with a whisk. Using your fingers, mix the softened butter into the flour mixture. Make a well in the center of the dry mixture and add the honey, molasses, and yeast-water mixture. Stir from the middle, bringing the dry ingredients gradually into the wet. You can start out with a wooden spoon but will need to use your hands to finally bring the dough together. 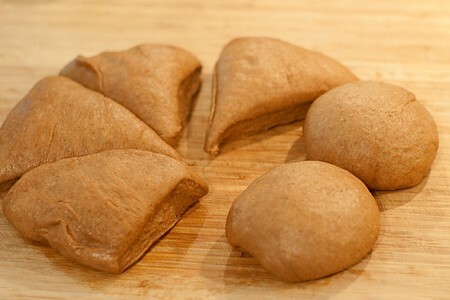 Turn the rough dough out onto a lightly floured surface. Knead for 10 minutes adding small amounts of flour to the kneading surface only if needed. 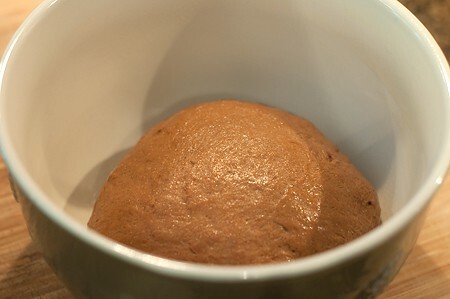 Let the dough rest for a few minutes while you wash and dry the bowl that you used to mix it in. Spray the inside of the bowl with cooking spray. Put the dough into the bowl top side down and then turn it over so that the top is coated with a bit of the cooking spray. Cover the bowl with plastic wrap and set it in a warm place to rise. The interior of an oven with the light on is usually warm enough. Let the dough rise for 1 to 1 1/2 hours or until doubled in size. When the dough has doubled, cut it into 6 portions. Form each portion into either a 6-inch log shape or a round mini-boule. Pour a small amount of cornmeal onto your work surface. 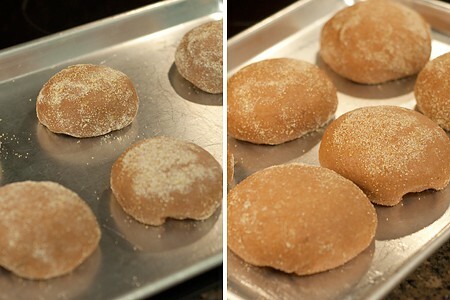 Moisten each dough portion very lightly by wetting your hands, removing most of the water and rubbing over the dough. Roll the lightly moistened loaves in cornmeal to coat. Gently pat to remove any excess cornmeal. Preheat the oven to 350 degrees. Uncover the dough and bake for 35-40 minutes. Remove from the oven and allow to cool for 10 to 15 minutes. Note: if you want your bread to be a darker color like the bread served at the steakhouse, you can optionally add food coloring to achieve that result. You’d need to add 1 1/4 teaspoons of red, 1 teaspoon of yellow, and 1 teaspoon of blue. I’m perfectly happy with the color of the bread without the added coloring. One year ago: Brown Sugar Bacon – Love it or Leave it? looks amazing! bread – anykind – is my love language! i’m such a carb lover! Carbs are my weakness, too! Especially fresh bread warm from the oven slathered with butter. Oh my! I just can’t resist. That looks absolutely wonderful. Amazing. Fabulous. And all other superlative adjectives. Who can resist? Not me. I’ve never been able to turn down warm bread straight from the oven. Doesn’t matter if it’s bread, rolls, pastries…whatever. There’s just something intoxicating about the smell of yeast breads baking! Working with yeast dough is one of my favorite things to do in my kitchen. This recipe sounds amazing Lana. Love that it has cocoa and molasses. I just printed it and will be trying it soon. Thanks for the recipe! You’re welcome, Renee! Hope you enjoy it as much as we do. Wish I had a slice of it right now. One of my favorite things. This looks amazingly delicious. Thanks, Barb! I think you’d enjoy this one. How much coffee granules? I am not seeing it. Stella – it’s 2 teaspoons. So sorry I left that out! Thanks for letting me know. I’ve corrected the recipe. I don’t see it in the directions, either. Am I missing it? Also why not just use warm brewed coffee? I don’t have coffee granules but it seems like it would work the same as warm water + instant. Annie – the coffee granules go in with the dry ingredients. Each teaspoon of the instant creates a cup of coffee when mixed with water. You’d have to use so much coffee to get the equivalent amount of flavor that it would make the dough far too wet. I love the coffee and cocoa powder in this recipe. It sounds delightful. Thanks, Shaina. It did turn out really good. This is one recipe that I’ll make over and over. Lana, looks like your research on this type of bread turned out better than mine. The loaf I tried before was too wet and a bit unstable – also a bit darker than my husband would prefer. This one looks solid but still soft and wonderful. I can hardly wait to try it. Your cooking instincts do shine, girl. Thanks for sharing! Thanks, Lorraine! This is a really delicious loaf with a beautiful texture. I’d love for you to try it and let me know how you like it. Thanks for the wonderful recipe. I love steakhouse bread and this looks perfect. I try to avoid coffee is there any substitute for it? Or should I just try it without it? Kytfox – if you can use decaf, try that. Otherwise, just leave it out and see how that works. It will change the flavor, of course, but I think it would still be delicious. What a gorgeous loaf of bread! Wish I had a piece right now! Wish you lived close by, Amanda. I’d run a loaf right over to you! Can I knead this with my Kitchenaide mixer? Also could I use rapid raise yeast instead of the active yeast. (rapid raise is what I happen to have on hand). Yes, you can knead it in the mixer and you can use rapid rise yeast. Thanks for the fast response Lana. Do you have a suggestion for how long I should knead the bread using my mixer? I am making this right now and kneaded for 5 minutes; I figured doing it by machine would not need the entire 10 minutes as in the instructions. I will let you know how it came out. That’s probably about right, Becky. I think the general guideline for machine kneading is about 5 minutes once the dough begins to pull away from the sides of the bowl. Lana, they turned out great. Thanks for sharing this recipe. So glad to hear that, Becky! I need to make some more myself. Thanks so much, Amanda! I really appreciate your sharing. This looks fantastic and makes my mouth water, I am definitely giving this a try!! 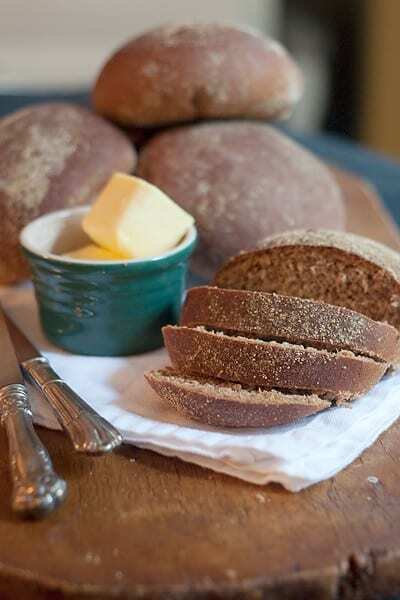 Have you ever tried The Soup Kitchen’s Honey Oat bread and if so do you also have a recipe for something like it? I love “honey” bread of any type and would love to be able to try them all! You’ll love this bread, Lenoria. It’s really good. I had to Google the Soup Kitchen – I was not familiar with it. Sounds like a great place! I just pulled my first attempt out of the oven, its wonderful! – have you ever tried freezing a loaf? If so how did it keep? Thanks for sharing the awesome recipe! Can this recipe be done in a breadmaker? If so do i need to make any changes to the amount of ingedients used? I haven’t tried this recipe in a breadmaker. recipes calls for? How long would I bake one loaf? I just want to say that I made this recipe last night, and it came out fantastic. I chose to make 12 rolls, baked about 20 minutes. Did not have corn meal so I used a combination of semolina/flour. These are definitely a keeper. Thanks so much for such a great restaurant favorite. I’m so glad you liked it, Carol. Reminds me I need to make a loaf. We haven’t had it in a good while! I have made it in my bread machine. The color came out like Outback’s (I did the food coloring suggestion). I didn’t have Instant Coffee, so I made a strong but not too strong cup of coffee and added it to the recipe. After it finished baking in my machine, although good flavoring, it was a little tougher towards the edges of the bread. The inner part of the bread was great. Now I’m the one with a question: how can I make it softer around towards the edges??? I made this to go with a pot of veggie/beef soup and it was so delicious! The molasses, coffee, and cocoa give it such a wonderful flavor. It was best right out of the oven, but it also made for some pretty tasty toast the next morning! Wondering if I can use my sourdough starter with this recipe? I suppose you could, but it would most definitely change the taste. I love Outback bread and I can’t wait to try this. If it wasn’t 90° with no air conditioning it would be in my oven right now. Thank you so much for the recipe. I’m so glad I found this. I made some Cabbage and Chicken Sausage Stew for dinner tonight and it was dying for a good bread to go with it. I didn’t have some of the ingredients the recipe called for i.e. instant coffee or bread flour. 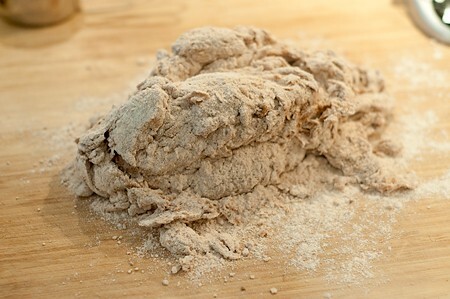 But I did have pasta flour, wheat flour, and white flour…lol. Had just enough of all 3 to have the flour needed to make the bread. Don’t ask me why all those mixed together worked but they did. This was some of the lightest and flavorful bread I’ve ever made. I can’t wait to make it again and follow the recipe exactly…or maybe I’ll just keep the flour combo – it was really that good!! !